Anubis (/əˈnuːbəs/) is ancient Egyptian God, who is wolf-headed and accompanied by Dogs. He is the God of Death and associated with mummification and the afterlife in ancient Egyptian religion. 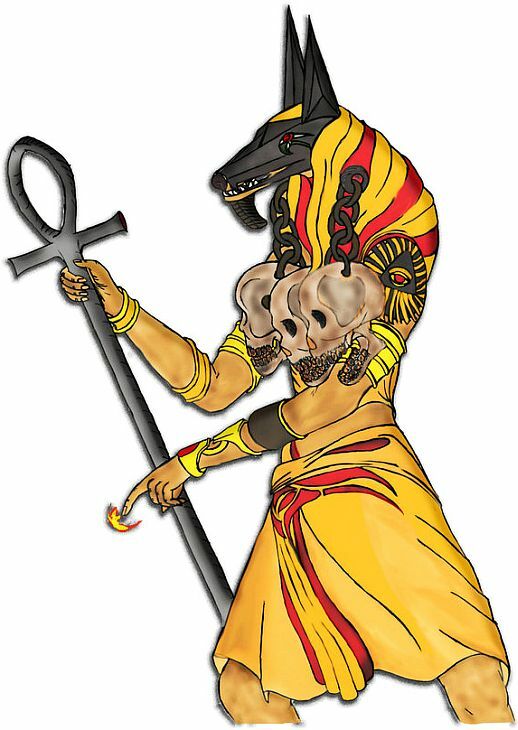 Egyptian God Anubis is associated with Wepwawet (also called Upuaut), another Egyptian god portrayed with a dog’s head or in canine form, but with grey or white fur. Historians assume that the two figures were eventually combined. He is seen as protector of graves ever since 3100 BC but later his roles have been changed or replaced. entre of the Anubis cult was in uten-ha/Sa-ka/ Cynopolis, a place whose Greek name simply means ‘city of dogs‘. Suprisingly, Indic, Coptic and Aztec religions all have Dogs at the center of their Death rituals and traditions. 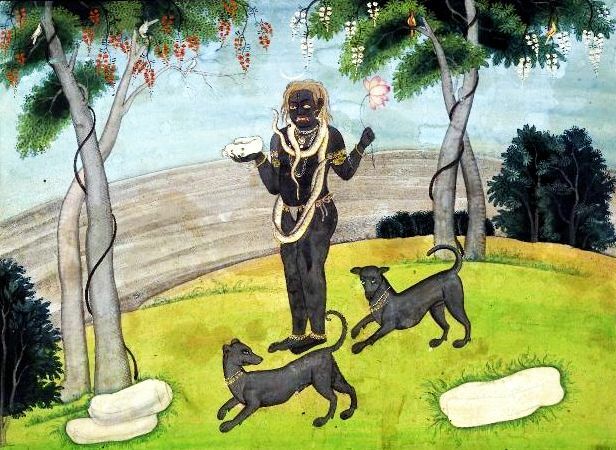 In ancient vedic tradition, Yamaraja, the God of Death is accompanied by Dogs and he himself has appeared as a Dog to join the Pandavas in their final days towards Amarnath shrine, eventually guiding Yudhisthira into heaven. In Nepal, which is a hindu country, people to offer blessings to dogs which are regarded as messengers of Yamaraj, the god of death and underworld (hell). 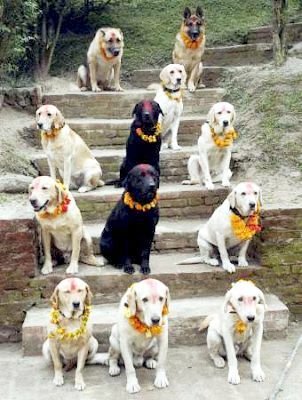 ‘Kukur Tihar‘ is the dogs day in Nepal. After worshipping the dog, it is given very delicious meal. The saying of ‘every dog has his day‘ comes true on this day and even a stray dog is looked upon with respect. Kaala Bhairava, is the fierce manifestation of Shiva associated with annihilation. Legand in Siva Purana says that when Brahma the creator became egoistic and started interfering in duties on Siva, a small nail from Siva’s finger assumed the form of Kala Bhairava and casually went on to cut the head of Brahma. Skull of Brahma (Brahma Kapala) is held in the hands of Kala Bhairava, Brahma’s ego was destroyed and he became enlightened. Kala Bhairava is actually the Bhairava (Terrible or Frightful) form of Kala (time). Dog is his vehicle and he is one of the 8 forms of Siva. His female consort, Bhairavi is a fierce and terrifying aspect of the Devi who is virtually indistinguishable from Kali, with the exception of her particular identification as the consort of Bhairava. 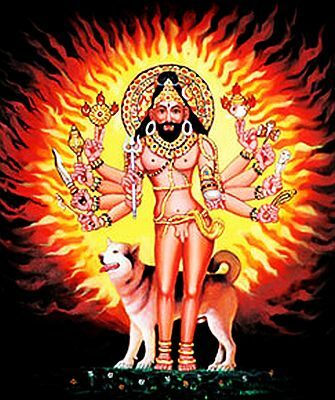 Bhairava is the guru of the planetary deity Sani (Saturn) and ain deity worshipped by the Aghora sect. In India, each Shaktipeeth (total 18) temple is accompanied by a seperate temple dedicated to Bhairava, as he is believed to be guarding that place. Kala Bhairava destroys sins and karma which are carried forward in time to our next life.